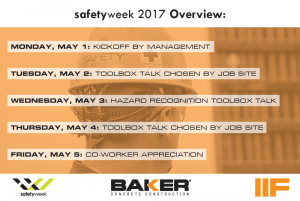 May 2017 – From Monday, May 1, through Friday, May 5, Baker joins over 50 national and global construction firms by participating in Safety Week 2017. For those unfamiliar with Safety Week, it is an opportunity to collectively raise awareness while inspiring everyone in the industry to be leaders in safety. More on Safety Week at www.constructionsafetyweek.com.